Staples is expanding its commitment to the connected home (and office) with new products and partners and will place consumer displays and educational materials in more stores as of July 15. The Connect platform, which consists of a hub and related connected devices that range form window blinds to doorbells is expanding to 500 stores, up from the 32 that launched on Black Friday last year. Staples has about 1,500 stores worldwide. The company is also supporting more radios with a newer and cheaper version of its hub. The new version will be made by D-Link and supports Bluetooth, Zigbee, Z-wave and Lutron as well as Wi-Fi. It will retail for $79.99, while the older version that only supports Z-wave, Lutron and Wi-Fi will now retail for $49.99. The hub and Connect software created by Zonoff helps deal with the mess of existing radios already on the market and lets the consumer create recipes for her home. Staples is also bringing in a bunch of new integration partners whose devices work with the hubs, including Jawbone, Polar and Samsung smart TVs. This brings the total number of devices supported by the Connect platform to almost 150. 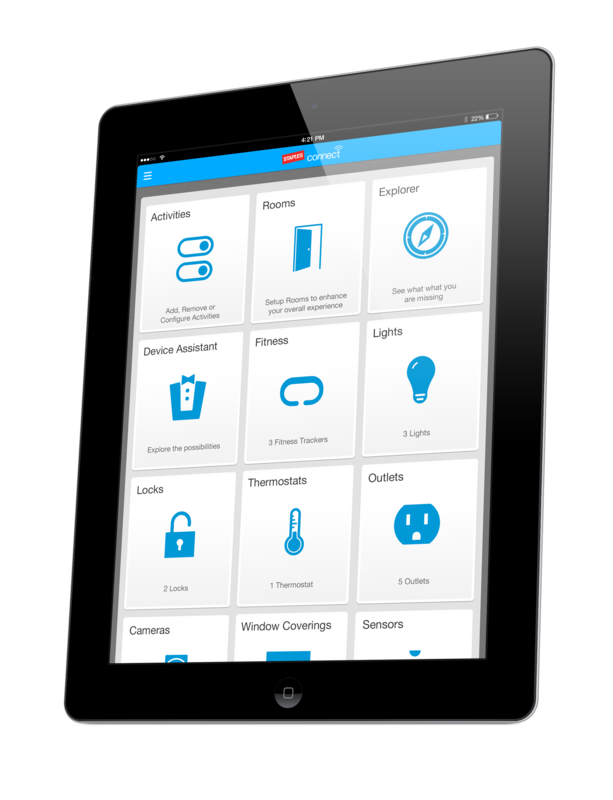 I’ve tested the Staples Connect platform and liked it — it’s easy to create programming rules and I really liked the Lutron gear. So far, the Connect platform is the only one Lutron has gotten behind, although the Revolv hub also has a Lutron radio inside. The connected home is important for Staples, especially as it’s also seeking to help small business customers connect their offices. Peter Gerstberger, Director/DMM, new business development at Staples, says that the products are also beneficial for the stores’ margin profile because many of the connected devices sell at higher margins than typical electronic devices like tablets and computers. 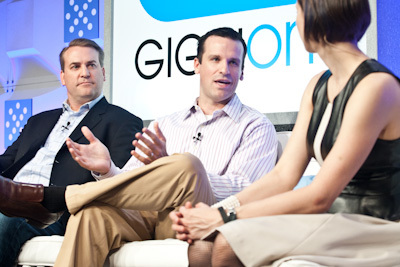 Gerstberger said that the average Connect platform user plays with the app or hits the Staples web site at least eight times a day and on average connects six to seven devices within the first two months. The most commonly connected device is a security camera, but after that it varies. The key to getting customers to purchase the devices and then keep them is to tell them how to use the devices. It’s not enough to show the hub, connected locks and a connected doorbell in the store. Gerstberger says Staples employees have to present the use case. For instance, you could ask a business owner if they ever miss package deliveries. When they say yes, the Staples employee explains that with a Doorbot, connected Yale locks and the hub, the business owner could see when the UPS man arrives and remotely open the door to get the package. Staples is not alone in ramping up its connected home push. Also this month, GE-backed Quirky is launching a separate company called Wink that will provide connected home products. Those products will be heavily promoted via a partnership with Home Depot(S HD), which is expanding the number of connected products in its stores. This week Microsoft(s MSFT) said it would offer Insteon products in its stores and Nest(s GOOG) launched a developer program aimed at making Nest the hub of the smart home. Apple (s AAPL) is working on a similar unification effort, with plans for a device certification program and software called HomeKit that should go live with iOS 8 this fall. What we’re seeing is both the logical expansion of retailers’ product lines and big tech brands trying to carve out a niche in something that is expected to generate billions in the coming years. And apparently those products will sell at higher margins that tablets or computers, which could be why everyone is rushing to stake a claim. Technology is not the challenge with the IoT. Seems everyone is focused on interoperability, which is a distraction. The challenge is in the business model. The central question is “what happens when this stuff doesn’t work?” Without monthly revenue greater than $20/mo, companies cannot afford to provide technical support. And without technical support, there will be no customers. Verizon exited the business after it learned this hard lesson; you can’t keep the lights on for $10/mo. Nest is trying to cover their support costs in the price of the product. Good luck with that! It costs $7 per month to provide technical support to smart home customers. In one year, that is $84. How long can the Nest product margins cover these costs? This type of business model is not sustainable. Extending on what John Antonchick said in his comment below, about the interoperability barriers of multiple communication standards used in smart home technologies, there are two other remaining barriers to widespread adoption. One remaining barrier is the reliance on programmed rules that can require help from a technician unless the DIY user is savvy enough to do the programming. The need for yet another “truck roll” to respond to new devices or behaviors that are introduced to the system can be avoided by (1) artificial intelligence, which is my personal preference, or (2) remote technician access. The second remaining barrier is demonstrating the value proposition to consumers. That’s a challenge, because of the heterogeneous home environment with its very many different types of devices: lights, security, HVAC, appliances, window treatments, door locks, lawn sprinklers, entertainment systems, etc. Even companies like BestBuy, Home Depot and Lowes have been unable to show the value, because these products are displayed in different parts of the store. It remains to be seen if Staples can overcome that obstacle with its consumer display, but I’m highly doubtful that they can. One thing that seems to be missing from most of these types of announcements is the detail re variations of the radio specs. I have met the Zonoff folks and trust them to do a good job with the (app) software. However, when referring to protocols like Zigbee, by design there are several different Zigbee standards, e.g. Zigbee Home Automation, Zigbee Smart Energy (3 versions) and Zigbee Lighting. Each is used in specific circumstances to optimize performance, security, etc. So, does the new hub support communication to smart meters using Zigbee SE 1.1 as well as Philips Hue lighting kit using Zigbee Lighting? BTW – It’s not clear to me whether other hubs also do this level of detail connectivity although the head of LOWES IRIS group said during CES last January that they would be upgrading their hub and/or providing other options. Plug in dongles might work but seem an awkward solution that has not been well accepted in the market (?). What’s your take?